Creative husband and wife duo Dylan and Pamela Dowdy just may be wheeling their small mobile shop to a hot spot (think: concerts, events, shops) near you. The Dowdy Studio Wagon is filled items they make in their studio space in East Dallas…Get to know the couple a little more by reading about the five things they love. Enjoy. True, they didn’t mention us by name, but we do know these guys and have shared many a sweaty Saturday at numerous local outdoor fairs… so that’s cool. We were tickled orange (much better than pink) to be mentioned in the ever-amazing DHome Blog by one Joslyn Taylor. I have a (not altogether healthy) succulent issue. Â Here’s how things pretty much go down.I spot a succulent, and I have to buy it. Â Do not pass go. Do not collect $200.In fact if you added up all the money I’ve spent feeding my succulent addiction over the past couple of years, it would be enough to pay for my family of four to go on a pretty spectacular trip…overseas. I do not exaggerate friends. It’s a bad scene. So (given how much I’d really like my children to get to experience foreign travel) I’m dialing things back a bit and declaring a ban on any future succulent purchases (no matter how tempting). Â In instances like these, the best approach tends to be diversion, which is why I’m now shifting my energy onto finding perfect little homes for all my beloved plants. I already possess a few architectural ceramics by Jonathan Cross (they’re the perfect mate for sculptural succulents), and I’d like to find some pots to add into the mix that don’t complete with my Cross creations but are less mundane than your standard issue terra cotta. I was instantly intrigued when I spotted Â these numbers at Bishop Arts Market yesterday (after a highly satisfying breakfast at Oddfellows). 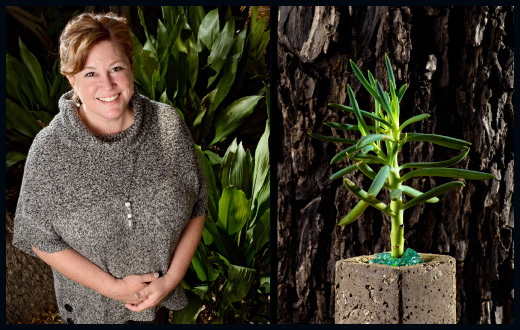 Â They’re the handiwork ofÂ Christine Unruh who crafts the diminutive containers out of concrete and then carefully considers the perfect succulent mate for each vessel.Â Christine, you’re my kind of crazy (in the best possible way of course). I think they might be just the thing to divert me…At least for a while. Um, Joslyn, just shoot me an email and I’ll be happy to comp you a succulent. Your choice. I’ve got some new ones you haven’t seen yet. Also, I found it interesting that she was such a huge fan of Jonathan Cross, which I am as well, having collected some of his ‘brutalist’ style pottery when he was still hanging out with us at the White Rock Local show. He’s my hero, for reals.